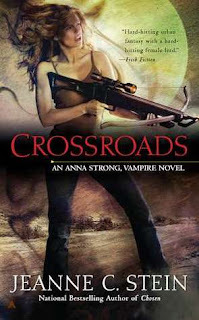 The Anna Strong series is one that I have always thought of as promising. I'd enjoyed every book to some extent - they're diverting if not compelling - and I felt like this was a series that was on the verge of being really good. So what do you do when you realize that you are already up to book 7 and still waiting? Blurb: The death of Anna's old vampire mentor is causing ripples in the mortal world. His forensic report has brought up some anomalies and people are asking questions-questions that no vampire wants to answer. Anna needs to lie low, but the sudden discovery of a slew of drained bodies near the Mexican border brings an old flame back into her life and with him, a new challenge. Then, some stunning news from an unexpected source sends Anna and her friend Daniel Frey on a journey that may change both their lives-forever. The main story has Anna and her shapeshifter buddy, Daniel, trekking out to a Navajo reservation where they must deal with not only Daniel's young son but spooky goings on. Because most of the characters, as well as the locale, are new to the series, this book can easily be read as a stand-alone, pretty good for a book 7. However it is an unexciting entry in a series that already needed some adrenaline or a power bar or something. There isn't much suspense here. There's a problem with a supernatural killer in the desert and then... Anna takes care of things. Anticlimactic and kind of blah. Oh, there are potential problems coming down the line; Max has re-entered Anna's life and you know there is unfinished business and a Samsonite set of baggage there. Plus, Anna has a new man. He's a news anchor and a human. Yeah. That's gonna work. Thankfully, he's barely in the book 'cause I can't get invested in that. Meanwhile, Detective Harris has questions about William's murder and he has made it clear he'll only let Anna put him off for so long. So a storm's a brewing. Just not in this book. Instead, Anna and Daniel are involved in a murder mystery in Monument Valley. Despite the body count, it feels a little Scooby Doo. A skin walker is killing folks and it is up to Anna to put a stop to it. Honestly, the whole skin walker thing seemed unnecessary. The bad guy could have easily have been just a regular joe and it would not have made a difference to the plot. And I gotta say, I didn't like how the Navajo portion of the story was handled. The writing was clunky. It felt like the author did a lot of research on the Navajo culture and then shoveled the details out in a ham-handed fashion. I did think the author worked very hard to be respectful to a group that has continuously been misrepresented and maligned but it came at the cost of the story. And Chael is back and the reason for Anna and Daniel's visit to the reservation. Supposedly, there is a shaman who can restore Anna's humanity. She will no longer be The Chosen but she'd get to be human again. Should she do it? Can she turn her back on the supernatural world so that she can rejoin her family? The answer is obvious, of course and so the angsty waffling is hard to take seriously. Considering this is book 7, I think it's well past time for Anna to have accepted who she is and start concentrating on who she wants to be. The whole shaman thing just seems like a lost cause. All this may make it sound like I hated this book. I didn't. It's not terrible, merely ok. There was no forward movement for the series and the mystery was unexciting. I think Crossroads could have worked better if it was a novella or a short story. There wasn't enough here to sustain a full length novel.